The Coloured Raine Vivid Pigment Palette retail for $50US for 16 X 1.8g/0.06 oz of product each. 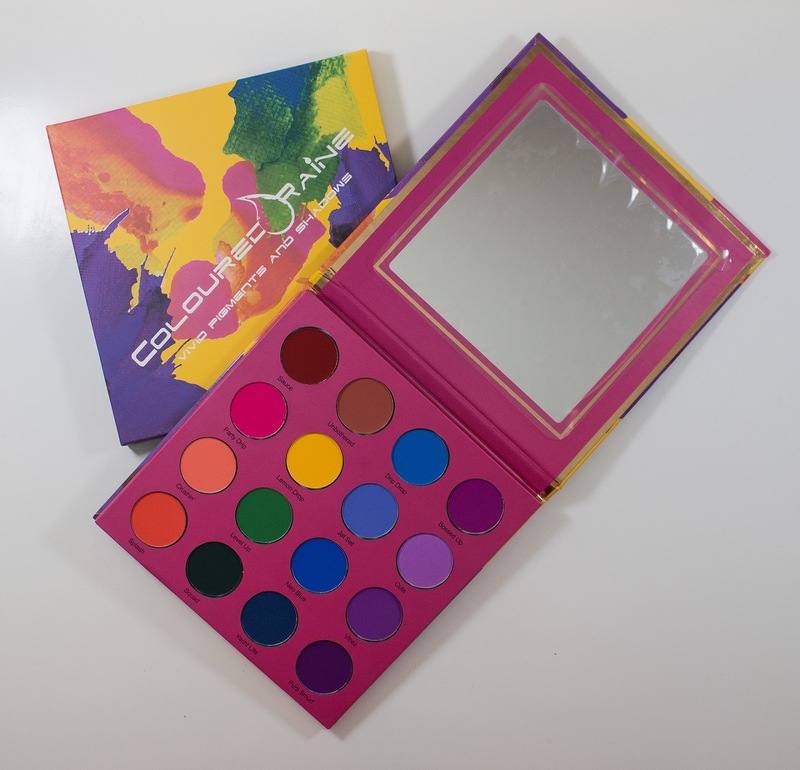 Coloured Raine Vivid Pigment Palette, box art and palette lid front. 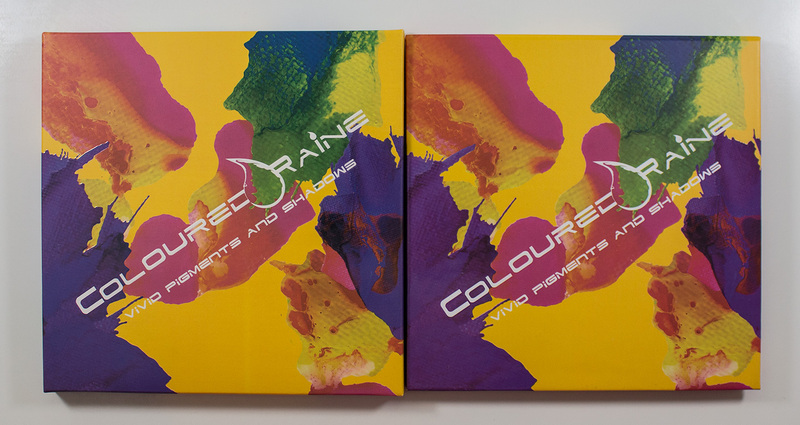 Coloured Raine Vivid Pigment Palette, box art and palette back. Talc, Boron Nitride, Zinc Stearate, Mica, Silica, Kaolin, Triethylhexanoin, Vinyl Dimethicone/Methicone Silsesquioxane Crosspolymer, Lauroyl Lysine, Phenoxyethanol, Ethylhexylglycerin, Tin Oxide. May Contain: Yellow 5 Lake (CI 19140), Red 40 Lake (CI 16035), Iron Oxides (CI 77491, CI 77499), Titanium Dioxide (CI 77891), Red 6 Lake (CI 15850), Red 7 Lake (CI 15850:1), Ultramarines (CI 77007), Red 27 Lake (CI 45410), Blue 1 Lake (CI 42090), Chromium Oxide Greens (CI 77288), Ferric Ferrocyanide (CI 77510), Manganese Violet (CI 77742). Sause is a rich red with a matte finish. Party Dip is a hot pink with a matte finish. Crushin' is a bright peach with a matte finish. Splash is a rich orange with a matte finish. Unbothered is a rose terracotta deep rich orange with a matte finish. Lemon Drop is a bright yellow with a matte finish. Level Up is a bright green with a matte finish. Squad is a deep forest green with a matte finish. Drip Drop is a cerulean blue with a matte finish. Jet Set is a periwinkle blue with a matte finish. Neo Blue is a denim blue with a matte finish. Yacht Life is a rich marine blue with a matte finish. Bossed Up is a vibrant fuchsia with a matte finish. 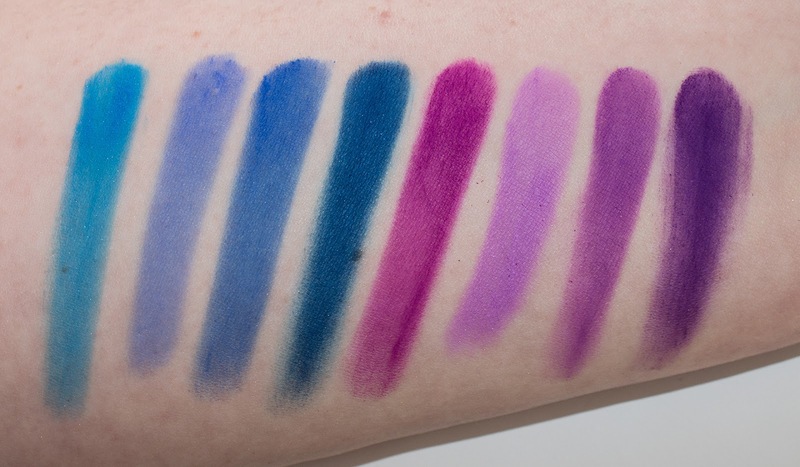 Cute is a bright lavender with a matte finish. Vibez is a bright plum with a matte finish. Purp Smurf is a rich purple with a matte finish. Wear: With a base/primer these do stay all day without any fading. On their own, they do fade evenly to a sheer wash in 6-7 hours with my semi-hooded lids. 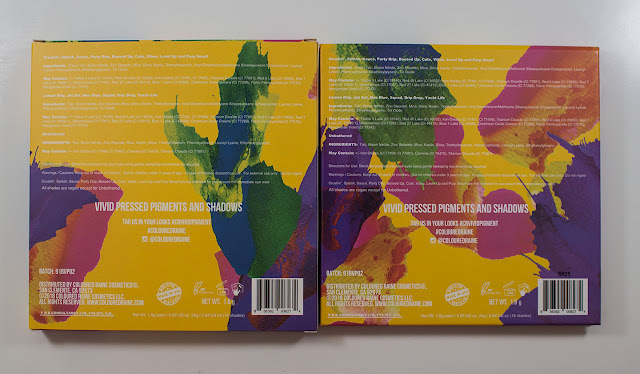 Packaging: Basic magnetic closure palette made of card stock. 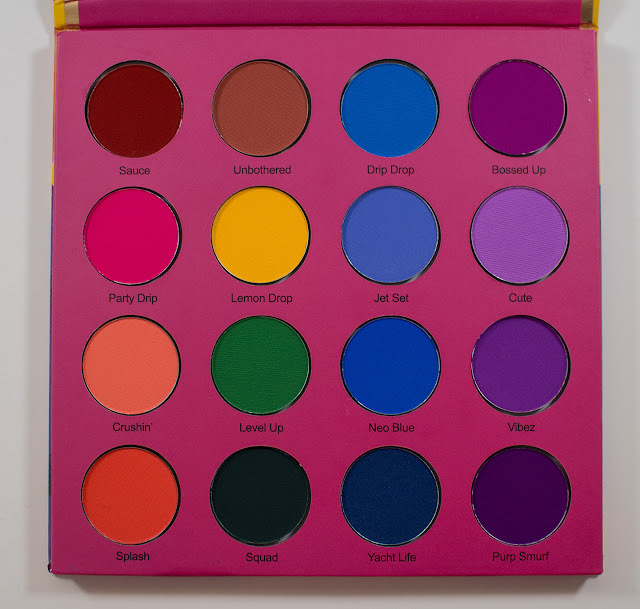 Shades by columns: Sause, Party Dip, Crushin', Splash, Unbothered, Lemon Drop, Level Up, Squad, Drip Drop, Jet Set, Neo Blue, Yacht Life, Bossed Up, Cute, Vibez, & Purp Smurf. 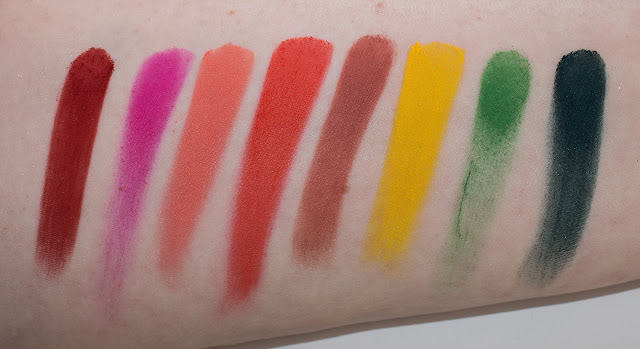 Daylight swatch: Sause, Party Dip, Crushin', Splash, Unbothered, Lemon Drop, Level Up & Squad. Flash swatch: Sause, Party Dip, Crushin', Splash, Unbothered, Lemon Drop, Level Up & Squad. Daylight swatch: Drip Drop, Jet Set, Neo Blue, Yacht Life, Bossed Up, Cute, Vibez, & Purp Smurf. 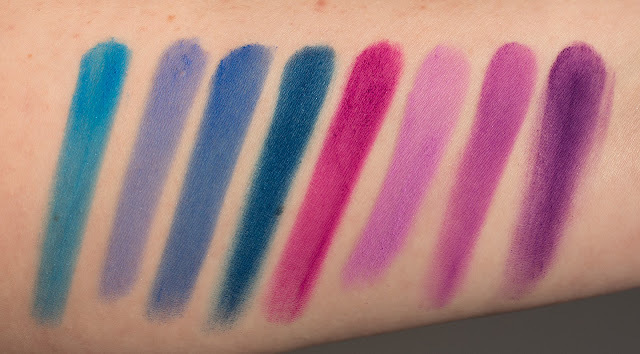 Flash swatch: Drip Drop, Jet Set, Neo Blue, Yacht Life, Bossed Up, Cute, Vibez, & Purp Smurf. 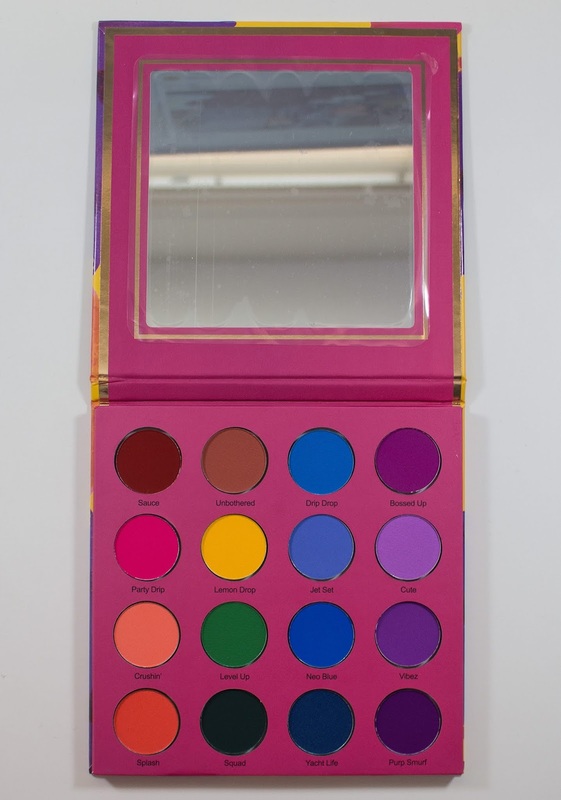 This is 100% a pure pigment eyeshadow palette with a lot of saturated colour shades for colourful looks. They are drier due to the nature of the pigments, but these are very nice if you want these shades.